CORVALLIS, Ore. (AP) — When Washington State fell behind on Saturday, the Cougars‘ offense responded, and that’s part of the team’s mindset, said quarterback Gardner Minshew II. “Any time our backs are to the wall, we’re going to come out swinging,” Minshew added. Minshew threw for 430 yards and five touchdowns as Washington State scored 28 straight second half points to beat Oregon State 56-37 on Saturday night. Tay Martin had 119 yards receiving and two touchdowns and James Williams added 134 yards from scrimmage and a receiving touchdown for the Cougars (5-1, 2-1 Pac-12). “We have a bunch of guys who can make plays, and I trust any of them in one-on-ones,” Minshew said. Washington State Coach Mike Leach said Minshew has room for improvement this season. “He continues to get better as the receivers get used to him. 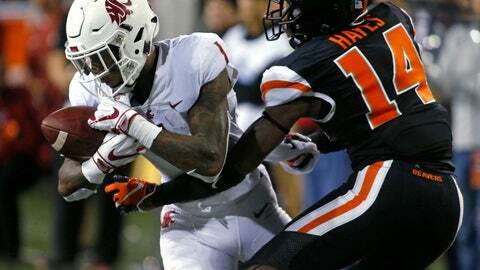 The receivers around him are young guys,” Leach added. Jermar Jefferson rushed for 139 yards and four touchdowns for the Beavers (1-5, 0-3). Oregon State hasn’t been able to stop the run lately, but Washington State stuck to its strengths – the Air Raid offense and Minshew’s arm – to pull away in the second half. Washington State stormed out to a 14-0 lead in less than two-and-a-half minutes, thanks in part to a blocked punt that was recovered for a touchdown. But Oregon State tied things up before the end of the first quarter, scoring its second touchdown after a muffed punt by the Cougars. The Cougars led 28-24 at the break, but trailed 30-28 after Oregon State scored first in the second half. Washington State responded with two touchdowns, and led 42-30 early in the fourth quarter. The Beavers appeared poised to respond, but the Washington State defense forced a fumble from Jefferson that was recovered in the end zone. The Cougars pounced on the opportunity, and an 80-yard drive was capped by a 27-yard touchdown pass to Martin with 9:06 remaining. Washington State: Minshew entered Saturday leading the nation in passing yards per game (398.4). He has thrown for more than 300 yards in every contest this season. . The Cougars likely improved their chances to move into the Top 25. Washington State received votes in last week’s poll, and the team’s only loss was by three points at Southern California on Sept. 21. Oregon State: Quarterback Conor Blount left the game about midway through the fourth quarter with an injury and did not return. . Jefferson, a true freshman, scored his 12th touchdown of the season. TRICKERATION: The Beavers broke out numerous trick plays, including an unsuccessful onside kick that resembled a soccer cross and a kickoff returner camouflaging himself in the end zone by lying face down, getting lateraled the ball and going for 55 yards. “Usually when you have that many in your bag you don’t end up connecting with that many, but they did,” Leach said. MORE THAN ZERO: The Cougars had a grand total of zero yards rushing last week against Utah, and Williams said that motivated players. “We felt like this week, we had an opportunity,” he added. The Cougars finished with 17 rushes for 62 yards, 46 of them by Williams. Washington State hosts Oregon on Oct. 20. Oregon State hosts California on Oct. 20.